Our sculpture of the BBC brand icon, the Blue Peter Galleon, is afloat in Bristol! 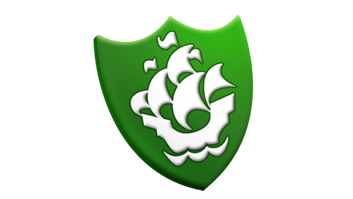 When the BBC rang to ask us about making a sculpture of their iconic galleon which features on the Blue Peter badges, we were delighted to explore their options. 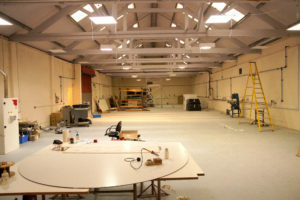 As with most television props, the timing was tight to design and build it – so that filming could go ahead on schedule. We had a total of five days, from taking on the brief, to have the model ready for collection on the Monday by the Blue Peter presenter Radzi. 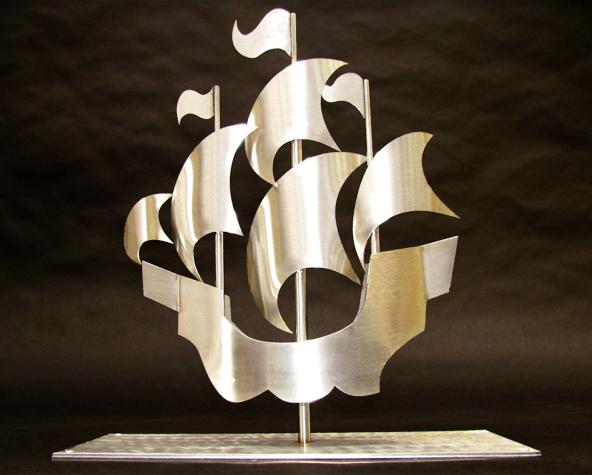 The Blue Peter Galleon is easily recognised, so it was a challenging job to preserve the image and accurately re-produce it in 3D stainless steel. 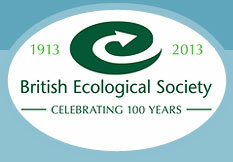 In conjunction with Avon Wildlife Trust, BBC Bristol has been developing a wildlife garden at the side of the Broadcasting House building on Whiteladies Road in Bristol – which is very near our workshop. The BBC plans to use the garden as an outdoor classroom for school pupils visiting the site. 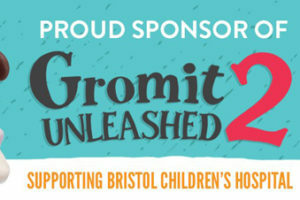 To update everyone involved on the progress, the Blue Peter and CBBC Wild presenters were filmed building a pond on 1 June with an audience of young helpers. To complete the pond, the idea was to have a sculpture of the Blue Peter galleon, sailing in the water as a permanent reminder of their involvement with the garden! BBC Points West shared the video clip on Facebook after airing it that day. 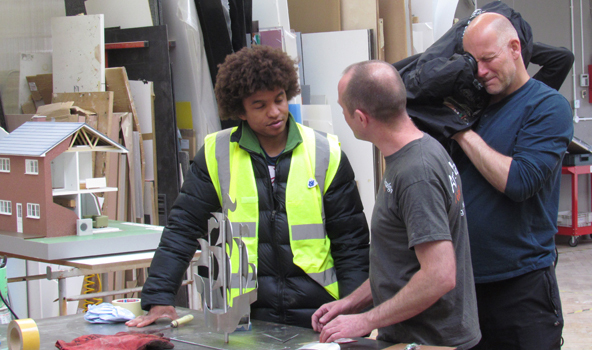 Very exciting for us, the Blue Peter team developed the story into a feature on their programme, airing on Thursday 11 June, to include the day their presenter Radzi came here to the workshop to collect the sculpture. We can’t wait to see our star of the show, Sean Taplin, who was interviewed by the production team about the fabrication of the model galleon. 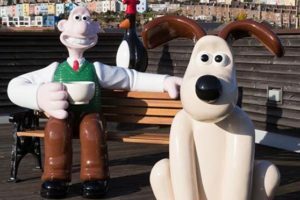 The research team from the BBC contacted Amalgam because of previous work we’ve done for them (did you see the One Show blog last month?) and gave us approximate dimensions for the sculpture. To withstand wear and tear in the water, we agreed instantly that it should be made from stainless steel. In the workshop, we discussed the engineering requirements and handed the design over to Sean, to develop the 3D CAD model – from which he extracted the profiles of the galleon’s curves. The stainless profiles were laser cut, rolled and beaten to the exact design. One of our specialities here at Amalgam is completing projects fast for our clients – and the sculpture of the galleon was no different. Once all the steel parts were cut and ready, there was still a complex job of welding and fabrication to complete the model before the film crew arrived. The dimensions of this sculpture are 400cm high, 350cm wide and a depth of 150cm, and it is set on a plinth to stand up in the pond. The finishing touch on the top of the sculpture is the green Blue Peter crest, which is Blue Peter’s environmental award, which is given out on programs or for any correspondence from viewers with a conservation, nature or environmental theme. Will Sean get a Blue Peter Badge for his efforts? If you are interested in more of our work for television and film, head over to Our Work – where we have plenty of examples of props, as well as set design, exhibition and display items.